This colourful gluten-free dish is delicious, packed with nutrients, and super filling. It makes for a great healthy lunch or dinner meal. adds flavour and more texture to the quinoa mix and of course added health benefits. This sweet-tasting root vegetable is rich is dietary fibre, naturally occurring sugars, complex carbohydrates, protein, vitamins A and C, iron and calcium. Sweet potato is also high in beta-carotene, vitamin B6, thiamine, niacin, potassium and copper. This is a vegetarian meal. To make it vegan simply subtract the cream cheese from the recipe. In a cooking pan bring 360 ml of water to the boil adding 1/2 tbsp of salt and the quinoa. Leave to simmer on low heat for about 15-20 minutes, until cooked (check back of packaging for specific instructions). Stir occasionally to ensure the quinoa does not stick to the pan. In a separate pot filled with water add the sweet potato and allow to boil over medium heat. Cook until the potato slices are soft then drain and gently mash. Add a tbsp of olive oil and the cream cheese (optional) and mix well. Combine the quinoa with the mashed potato and season with the cumin, and salt to taste. Place the tomatoes, carrot and rocket leaves in a dish or a bowl, drizzle with olive oil and balsamic vinegar and mix well. 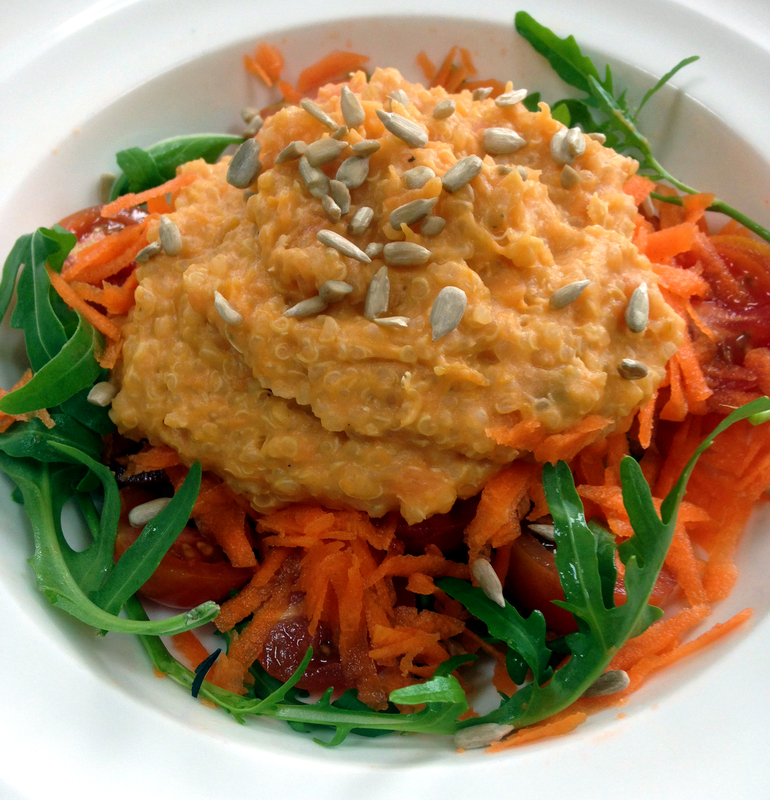 Top the salad with the quinoa and sweet potato mixture and sprinkle with sunflower seeds. I love your blog! It’s so inspiring! ❤ I would love to get some pointers from you!